One of my favorite things to discover are new traditions that I can share with my family, so I thought it would be fun to share a little tradition with you that you may or may not know about! Have you ever heard of St. Phanourios? I sure hadn't! Well, that is, I hadn't until my friend introduced me to him! One morning, Elizabeth and I showed up to my friend Alexis' apartment for a usual playdate/mommy-hang-out. She set out homemade donuts on a pretty wooden cake stand on her kitchen island and had iced coffee ready to go. Side note, if you ever get the chance to make a friend like this, never let them go! GOD BLESS HER! I was struck with how adorable these donuts looked all covered in yummy powered sugar and inquired more about them. She said "Oh this is my St. Phanourios cake I was telling you about! I just made it in donut form!" I'm pretty sure my response was something dramatic like, "Ummm what? Is this a thing? I forgot! Remind me again about this Saint." Have you ever lost something and thought, "Gosh I wish I could find that! If I could, I would ______." Well, this might interest you! St. Phanourios is known in the Orthodox Church as a saint who helps people find lost or stolen items, or helps single people find a spouse! Neat huh? We can ask the Saints for help! We ask St. Phanourios to help us find whatever it is we lost, and when we find it, we bake a cake and share it with friends and loved ones as a way of giving thanks. And today is actually St. Phanourios' feast day (August 27th). Which is just another great reason to make these yummy treats! Later Alexis explained how she lost her daughter's earrings that were a very special gift, so she prayed and asked for St. Phaniourios help to find them, and she found them! So as a way of giving thanks, she baked Fanouropita (or St. Phanourios cake). I asked her if other people make this cake into donuts too, because clearly I've never heard of it, and she actually wasn't sure if anyone did, but she had a really great recipe from Figs and Feta Blog that she adapted and made into donuts. GENIUS! What a fun way to give thanks to God for His saints for helping her find those special earrings that went missing. Not to mention a very YUMMY thanks! I cannot wait to share this tradition with my own family and to teach my children these rich traditions as we live out the life of the church! And just for fun, here are some cute pictures we took of Elizabeth later that day in Central Park. Mommy playdates with a photographer are the best! It's hard to believe that it's been one whole year since we packed up all our earthly goods and moved clear across the country from Southern California to New York! I thought it would be fun to put together a little highlight reel from our first year at Seminary. 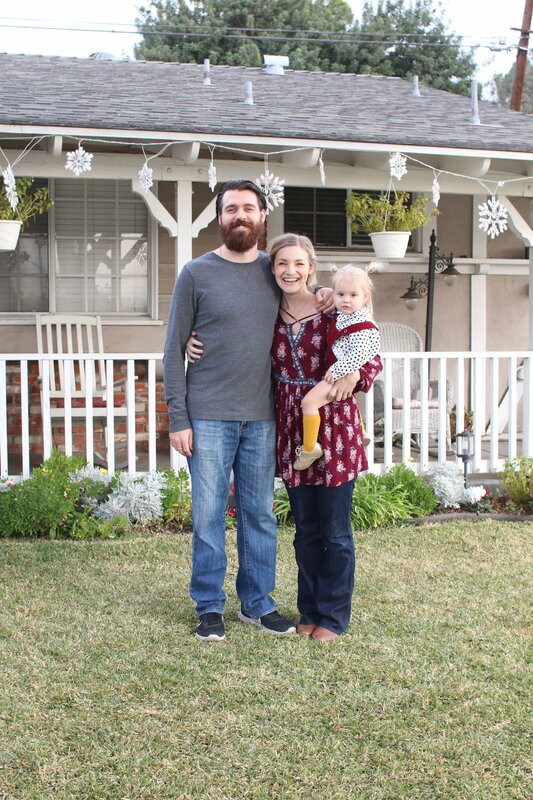 We've grown closer as a family unit, learned how to live far away from friends and family for the first time, built relationships to last a lifetime, and experienced living the life of the Church in a more focused way than ever before. I say it over and over again, but we feel so blessed to be here preparing for such a sacred role of serving the Church. So, here are some highlights from our first year! 1. Moved across the country! August 1, 2017 we relocated to Yonkers, New York as my husband began his coursework at St. Vladimir's Orthodox Seminary. Over his 3-year program, he will receive a Master's of Divinity, and God-willing, he will become Priest in the Orthodox Church. The move here was extremely smooth! Our stuff arrived in a timely manner and we were able to settle into our apartment fairly quickly. We sold a lot of things prior to our move, so I did some garage sale-ing and thrifting to find the perfect pieces for our new place. I seemed to find a lot of antiques and wooden gems (for a bargain I might add) that matched perfectly with my boho/eclectic style! Our apartment was very dimly lit and doesn't have many windows, so we created a "romantic ambience" as I like to call it. We set up lots of "mood" lights and plants to create a cozy little home. It's probably my favorite places we've ever lived! I love collecting wooden, wicker, and rattan items, along with fake plants (can't keep anything alive these days), and a mixture of patterns to create my boho style! Elizabeth helping me cook dinner one evening! You can see a painted version of this in the new Orthodox Children's Calendar for 2019! 2. Exploring New York City + coffee! As an ESFP (Myers Briggs personality type), I have a lot of energy and need adventure so living in New York was a treat! There were so many places I had never been and I couldn't wait to bring my little mini-me along to explore! Turns out she loves exploring just as much as mommy does! We went to the NYC a number of times (it's about a 30 minute train ride from where we live), saw all that Westchester County has to offer, enjoyed visits from family and friends throughout the fall/winter, and found as many of the delicious coffee shops we could. Some of our favorites include Blue Bottle Coffee, Stumptown Coffee Roasters, Devocion, Absolute Coffee, La Colombe and of course you can find a Starbucks on every other street corner. Everyone raves about Dunkin' Donuts but to be honest there's much better coffee out here! My husband was assigned to St. Nicholas Cathedral in Brooklyn, NY so we attended liturgy there every Sunday. We absolutely fell in love with Brooklyn! There are so many neat coffee shops, restaurants and a million places to walk to. Definitely worth visiting if you ever make it to New York City! Baby wearing in our Lille Baby carrier in Time Square! Elizabeth loved being carried. Visited Turtleback Zoo in NJ and Elizabeth LOVED it! 3. Visiting Niagara Falls! It's been my mom's lifelong dream to visit Niagara Falls, so when she came to visit in October, we made the 6 hour trek up north! I had never been either so it was such a fun adventure! We stayed on the Canadian border (which I highly recommend) and the weather was absolutely perfect. The leaves were just beginning to change and it was in the 60's-70's. 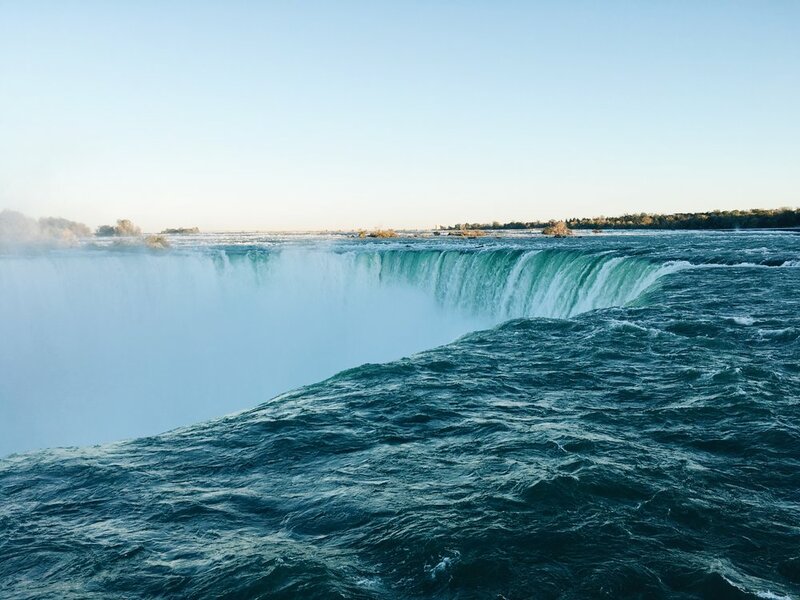 Elizabeth just kept saying "wow, wow" as we watched the water rushing down the abyss. It was a terrifying/amazing thing to witness the water moving at such a fast velocity down the waterfall and to feel the mist on our faces. It was absolutely breathtaking! Again, worth visiting if you ever have the chance! 4. Making new friends! I always joke that moving to seminary was like a dream come true because I get to live near all my friends! And what's better, they are all doing the same thing as us - raising their families while preparing for the Priesthood. I think half of what made the transition so smooth was we moved right into an active community. There were built-in activities for the kiddos to help them celebrate the various church feasts and a wives group that meets every Monday night (kid-free I might add)! 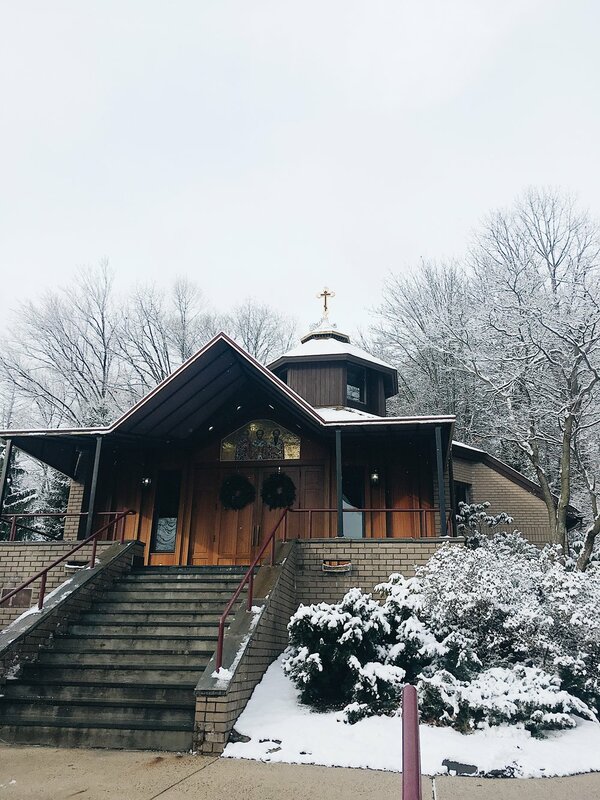 We also have the benefit of living within walking distance to the Seminary chapel, which means we can attend all the services that are offered. In addition to the community here at St. Vladimir's, I had the pleasure of meeting one of my closest friends, Alexis. What's even more fun is that we met through Instagram! I could write an entire blogpost about the importance of making friends in a new place (and I plan to write one!) but she was a God-send, truly! For every mom, it's essential to have a friend who you can do life with. And by "do life" I mean, you know, sit and fold laundry and drink coffee while watching your babies run around! Of course we have lots of fun together too, in addition to our daily chores. She is responsible for all the beautiful pictures taken of me and Elizabeth on my instagram, because she also happens to be an amazing photographer! We both love adventures in the city, taking pictures, drinking coffee, oh and we love Jesus and have the same ideas about how we want to raise our children. Match made in heaven! Another random fact: people ask us all the time if we are sisters. I suppose we do sort of look alike! I also recently was able to meet up with another fellow Instagramer and her sweet baby boy. How neat is that? I love this little instagram community and how it brings people together! 5. First real winter! Being native Southern Californians, "real" winter was something we had never experienced before. To be honest I was terrified! I didn't know what to expect. I had never lived somewhere where it snowed and I kept hearing about how dreadfully cold it is and how people tend to get seasonally depressed. Being locked inside my home for extended periods of time makes me stir crazy! I like to get outside and explore! Well, turns out - I LOVE WINTER! I didn't realize this was something I could even like, but I actually did! It was such a joy to experience the cold/snow alongside my daughter. She loved the snow, didn't mind getting bundled up, and we got outside nearly every day to enjoy the weather! And if there was a lot of snow one day, we just stayed inside and did some baking and drank hot coco. We also received an amazing blessing from a local church who gifted us with snow clothes, boots and equipment just in time for the first snow fall. God really does provide! Central Park over looking the city skyline on a freezing day with my sisters and nieces! 6. Home for Christmas! Where would we be without our wonderful family? Our families put their finances together and flew us home for Christmas; a blessing we were not expecting! Going home and spending Christmas with our home parish and families was the little piece of heaven that we needed to keep going. There's nothing quite like being home for the holidays! We got to spend some time at my grandparents' cabin in the mountains, visited close friends in San Diego, and soaked up as much time with our family as we could during our 2 week visit. Our little crew! Notice the lack of coats ;) California "winter" at its finest! I love this picture of my nieces and Elizabeth. It still cracks me up that she is the only one smiling! 7. Church happenings! 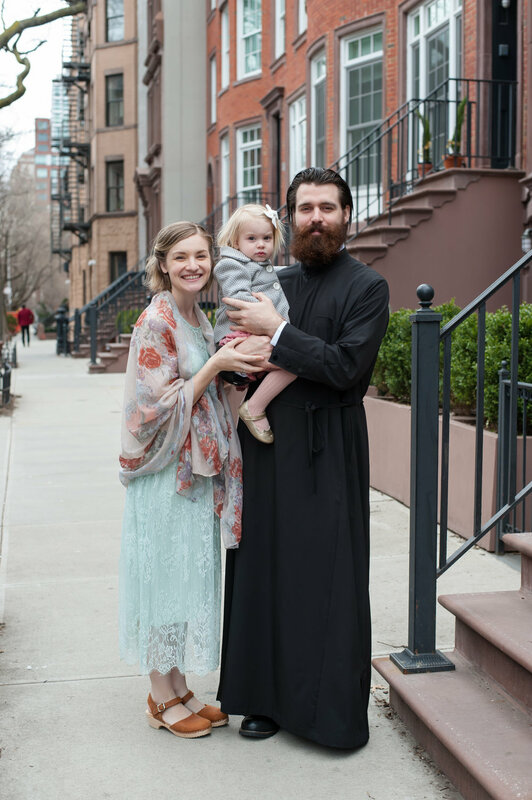 In January, my husband was elevated as a sub-deacon in the Orthodox Church. It's such an honor to serve the Church in this way and we are so grateful for this journey. We also spent Pascha/Easter at St. Nicholas Cathedral in Brooklyn, NY. It was an absolutely beautiful service and to top it all off we stayed up until 3 AM eating, chatting and celebrating the resurrection of our Lord! Metropolitan Joseph blessing Jarod as a sub-deacon. A special day indeed! A photo taken on Palm Sunday at the Cathedral. You can see my husband there in the middle assisting those partaking in the Eucharist. 8. Elizabeth turns 2! We decided to skip a party this year and instead spent the day going to Church and getting ice cream. It was simple and it was the perfect birthday for a 2 year old! She is a delight and has grown so much since we moved here last August! My lovely friend Alexis El Massih takes my bump updates every month! Follow along on instagram! 10. New blog! Well, considering you are reading this list on my blog - you've probably already know of its existence ;) I've been dreaming about doing something like this for YEARS and I'm so excited it is finally here! I even got a fancy logo and everything. I enjoy writing so instagram is my way of journaling while also connecting with others. My hope is that with my blog I can share even more about our life at seminary, motherhood, fun adventures we go on, products we use and love, and of course my sweet little daughter Elizabeth! As a stay-at-home mom it's been rewarding to have a little side project of my own to work on each week! Thanks for checking out our highlight reel from our first year at Seminary!